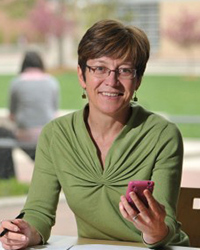 Dr. Sheana Bull is a nationally and internationally recognized expert in the field of technology based health promotion. Her work for the past decade has focused on development, implementation and evaluation of interventions using computer kiosks, the Internet and cell phones to facilitate HIV and STI prevention and self-management of chronic illness, including diabetes and heart disease.Dr. Bull has taught courses to undergraduate, MPH, and Ph.D. students in Public Health, Sociology and Health and Behavioral Sciences since 1998. She is the Course Director for HBS 7021, Theoretical Perspectives in Health and Behavioral Sciences, a doctoral level seminar taught in the Department of Health and Behavioral Sciences at UCD, which she has taught six times. She has co-developed a course for the MPH program in CSPH, CBHS 6611 Foundations in Health Behavior. She developed and taught a new course for CSPH in Spring 2010 entitled CBHS6670 “Methods for development and evaluation of technology based health promotion programs.” Dr. Bull’s teaching philosophy is to prepare students to think critically and become skilled in the effective oral and written communication of ideas. Bull, S. S., Brooks-Russell, A., Davis, J. M., Roppolo, R., & Corsi, K. (2016). Awareness, Perception of Risk and Behaviors Related to Retail Marijuana Among a Sample of Colorado Youth. Journal of Community Health, 1-9. Ybarra, M. L., Prescott, T. L., Philips II, G. L., Bull, S. S., Parsons, J. T., & Mustanski, B. (2016). Iteratively developing an mHealth HIV prevention program for sexual minority adolescent men. AIDS and Behavior, 20(6), 1157-1172. Coleman-Minahan, K., Chavez, M., & Bull, S. (2016). Immigrant Generation and Sexual Initiation Among a Diverse Racial/Ethnic Group of Urban Youth.Journal of Immigrant and Minority Health, 1-8.